In the history of football, how many people have had a move named after them and, on top of that, have had their name become synonymous with an entire system of play? As a result of Johan Cruyff, and the brilliant Dutch side he led to the 1974 World Cup Final, the Cruyff Turn and Total Football have entered into the football lexicon. Prior to the late 1960's, the Netherlands were considered to be minnows of European football. With the advent of a professional league in 1954, and the emergence of Feyenoord and Ajax as top European sides, the Dutch National side began to emerge in the early 1970's as a major player on the world stage. Total Football, as it was later coined, involved the flexible movement of players all across the pitch, moving and covering for each other to fill spaces and confuse opposition markers. This system, which was heavily influenced by the great Hungarian side of the 1950's, required players to be comfortable with taking on different roles and to have the intelligence to adapt as the teams shape could change at any time during a match. In order for this system to truly work, it needed an orchestrator and there was no one more suited to this role than the great Johan Cruyff. 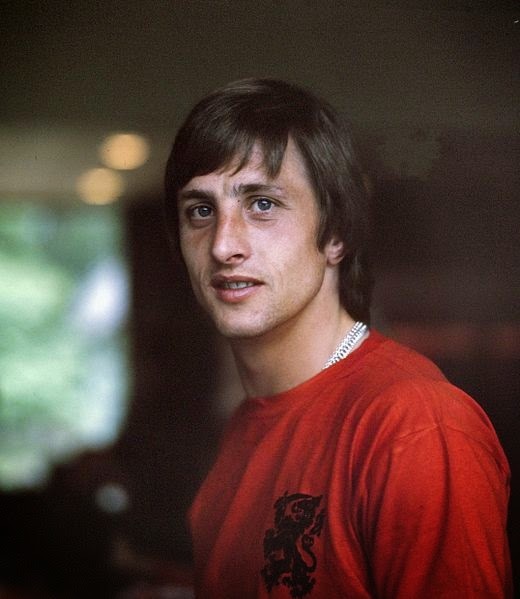 Joining Ajax's famous youth academy at the age of ten, Cruyff was already a three time Ballon D'Or and European Cup winner by the time he led Holland into the 1974 World Cup. A strong, vocal presence on the pitch, Cruyff served as coach Rinus Michels on pitch general, along with effortlessly floating between wings, into a withdrawn midfield role and then upfront to finish off attacks. He was the perfect model of the "Total Footballer", as he was comfortable in taking on different roles. 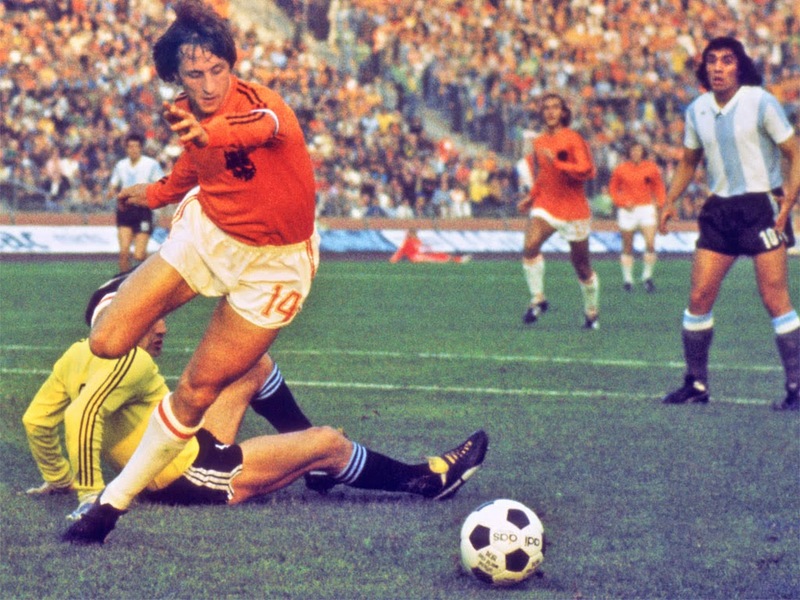 Cruyff has often been compared to a dancer in the way he gracefully moved on the pitch, and this was clearly evidenced in Holland's first round match against Sweden when he unveiled the move that still carries his name. Facing defender Jan Ollsson, Cruyff shaped as if he was going to cross the ball, but instead he dragged it behind his planted leg, pivoted 180 degrees and left the defender for dead. Playing some thrilling football, Holland easily progressed through the first round of the World Cup with wins over Uruguay and Bulgaria, either side of a draw with Sweden. In the second group stage, Cruyff found the net twice in a thrilling 4-0 demolition of Argentina. After a 2-0 win over East Germany, Holland defeated the defending champion Brazilians 2-0 with Cruyff on target again. In the World Cup Final against the hosts, West Germany, Cruyff took the ball from the kickoff and displaying the type of football that won this great Dutch side so many fans, the Oranje pass the ball around 13 times, before Cruyff burst into the box and was upended for a penalty. Without a single German player touching the ball, Johan Neeskens scored from the spot to give Holland the lead. Unfortunately for Cruyff and company, West Germany got back into the match through Paul Breitner and Gerd Muller, while Berti Vogts and Franz Beckenbauer shackled Cruyff for the remainder of the match. Despite their loss in the final, and the fact that Johan Cruyff never played in another World Cup, the impact he and his side had in 1974 will never be forgotten.